DELIVERIES. We operate a very quick turnaround from the point of ordering to shipping out your items. Commercial customers in mainland UK can enjoy next working day delivery on orders placed before 12pm (excluding Scottish Highlands). Orders from individuals will be delivered within 1-2 working days. We can also offer 9am, 10am, Midday and Saturday deliveries at a surcharge for orders placed over the telephone. VAT.Prices quoted include VAT at 20%. To see prices before VAT click on the 'Prices ex VAT' at the very top of the page. PAYMENT.Payment can be made on-line or by phone using your credit/debit card. American Express can also be used on-line but not over the telephone. DELIVERY CHARGES / DELIVERY COSTS.Our standard delivery area covers mainland England, Scottish Lowlands & Wales (excluding all islands). 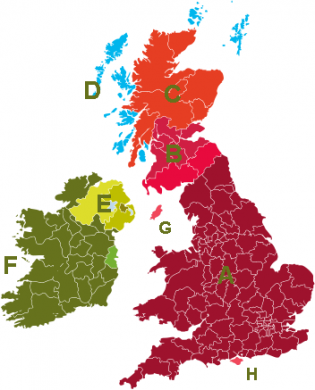 Charges for deliveries to other parts of the United Kingdom, Northern Ireland, Eire and International are calculated after confirmation of the delivery address. There is a shipping estimator in the shopping cart. EUROPE & NORTH AMERICA SHIPPING FEES.We can also ship to mainland Europe and North America using a 5-7 working day service. For European destinations orders can be placed through the website and there is a shipping estimator facility within the shopping cart. For further afield please contact us with your requirements for a quote.